While your car, and all of the luggage you care to leave in it, is stuck in its carrier, you have several options on where to spend your 17 hours on the train (though our train did get in 90 minutes early; when was the last time your plane did that?). Option one is spending the whole time in a seat. 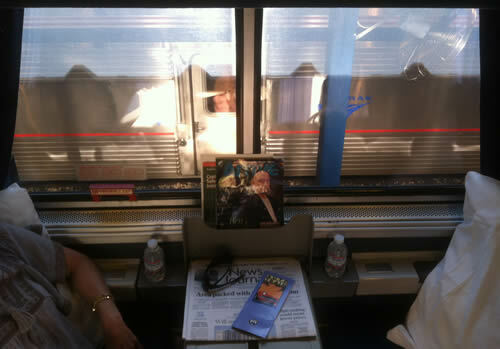 Amtrak seats are far more comfortable and useful (i.e. places to plug in your phone, laptop, etc.) than airline seating, but after a few hours, especially in the middle of the night, the sleeper cars start looking pretty good. The sleeper cars come in a variety of sizes, from small “roomettes” for singles and romantic couples (you’re going to be very close, you may as well travel with someone you can enjoy), on up to rooms and family-sized rooms. The sleeper cars, and some of the larger passenger rooms, also have bathrooms with showers, though the arrival time is early enough (we got in at 8am) that most people seemed to skip the shower. The drawback of the sleepers is the cost, which can double or triple that of your original ticket, quickly hitting $700 one-way. Which is why many drive one of the trips, say, down to Florida, but then take the train back. The travel itself is relaxing, with individual climate controls in the sleeper rooms, surprisingly decent food, plus large windows for looking out … or decent curtains for remaining hidden – especially useful when running along I-95. Outside is typical train travel fare: backyards, loading docks, and, north of Orlando, a large number of partially denuded Christmas tree farms. There are only two places to board/exit the train: Lorton, VA, south of the DC beltway a stone’s throw from I-95, and Sanford, FL, north of Orlando near highways 4 and 417. The approach to Sanford requires a lot of quarters for the tolls, but does offer numerous opportunities to get a tattoo or visit a pawnshop. Lorton is all about quickly getting on/off 95. If you’re planning to get snacks/drinks for the train (you should), get it well before arriving at either station, where the selections are limited. Arrival will require patience – with over 150 vehicles to unload, it can take a couple of hours before you get your car. Picture a very long wait at airport baggage claim and you’ll have a feel for the wait and the atmosphere. 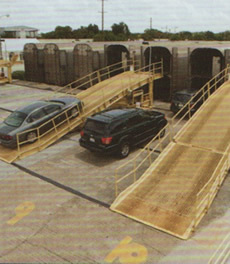 Since the car carriers are repositioned before departure and after arrival, when you arrived and dropped off your vehicle doesn’t appear to make a difference for who gets what first. Coffee helps. A hangover doesn’t. Once your vehicle gets unloaded, the number you were assigned when you dropped off the car will flash on a screen and get announced in the station, in case you don’t see it as it rolls off the railcar and into the arrival/departure area. Forgetting your number would be bad, though as long as you can recognize your car you should be ok.
Once you reclaim your car, you’re free to go – theoretically in a far better mood than if you’d just spent the last 15 hours crammed into your car and fighting traffic. God knows I was. Judging from the number of repeat riders, and how full the train was, I wasn’t the only one. 5 Comments so far. Leave a comment below. I hope to use auto rail some day soon. It sounds very good. I just wish I knew which web site I can find the cost on. I have taken the AUTOTRAIN several times, and have drivin the trip many times by car. I like the AUTOTRAIN best, just wish the price was a little bit lower for car and roomette. Anyone have a recommendation on taking a upper or lower coach seat? Also is there a better view on the right or left side going North? Leaving out from Sanford, I found that being on the left side (sitting facing forward towards the conductor left side) seemed to have a better view that the right side. As for upper or lower…… I was in a lower level roomette. I am glad I was on the lower vs upper. The upper level has the walkway that everyone uses to travel between cars, to get to the lounge car or dining car. Ergo, people constantly walking by your room. I feel that everyone will have a personal preference and you’ll have to experience it as least once before deciding for sure. I took my first Auto Train last week, from Sanford up to Lorton, unfortunately for a funeral. I am already planning my next one.